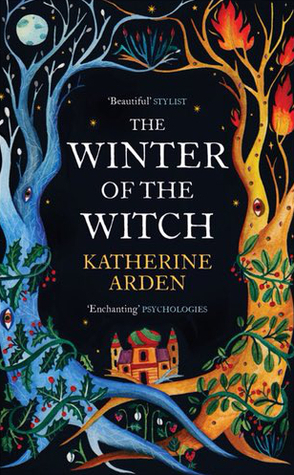 The Winter of the Witch is a wonderful, magical read and the perfect conclusion to Katherine Arden’s Winternight trilogy which combines Russian fairy tales, history and folklore with an atmospheric and wintry medieval setting. I loved the previous two books, The Bear and the Nightingale and The Girl in the Tower, so I went into this one with high hopes and high expectations – and I’m happy to say that I thought it was the best of the three. You may be wondering whether it’s necessary to read the books in order; my answer would be yes, as I think you will definitely get more out of the story if you start at the beginning. As the novel opens, Moscow is on fire and blame has fallen on Vasilisa Petrovna. With a furious mob calling for her to be burned as a witch, Vasya manages to escape with the help of the magical beings only she and one or two others can see. However, her freedom comes at a cost and, as part of the bargain, an evil spirit is unleashed into the world once more. This could have serious implications for Vasya’s cousin, Grand Prince Dmitrii Ivanovich, who is already facing the threat of the Tatar commander Mamai and his Golden Horde. As the Tatars advance into the land of Rus’, Vasya must enlist the help of the chyerti – her demon friends and enemies – in a final attempt to save her family, her country and its people. The reason I find the relationship between Vasya and Morozko so compelling is precisely because it’s completely unconventional. Morozko is not human and doesn’t always react or behave like a human; to him, Vasya’s actions sometimes seem illogical and difficult to understand – yet they love each other for who they are, and each accepts whatever the other is willing and able to give. This really is a great end to the trilogy; the beautiful, powerful writing took me through a whole range of emotions and I had tears in my eyes at the loss of a favourite character early in the book. I also love the fact that, despite all the fantasy elements, so much of the story has its foundations in Russian history. I’m sorry to have to leave Vasya and her friends behind, but I will look forward to whatever Katherine Arden writes next. This year I must read The Girl in the Tower and The Winter of the Witch. That first one in the trilogy just blew me away! You have a lot to look forward to, Judy. I thought each book was better than the one before. I loved this series and I’m longing to read this. I might even accord it the honour of spending my Christmas book token on it! I thought this was even better than the first two books. I don’t think you’ll regret using the token! This actually sounds good even though I don’t usually read this type of book. I don’t often read this type of book either, but I really loved this trilogy. I put the first one on my Goodreads list. I’m sooo happy this seems to be living up to its promise. I can’t acquire it until after my three month book ban, but I look forward to reading it then! It will be worth waiting for, Lory! I hope you’re enjoying the first book, Liz. I loved the whole trilogy and was sorry to reach the end, so I’m envious of people who are just beginning! Yes I am very much! This sounds like my next trilogy to read di nuovo, so glad it’s as good as everyone hoped it would be! I’m glad to hear you’re thinking about reading this trilogy. I think you would find the elements of myth and folklore interesting. Great review, Helen! It’s good to know that each book gets better than its predecessor. I’m looking forward to reading this trilogy, though not just yet. I have the first installment on my TBR. Yes, it’s great when a series just gets better and better. I hope you enjoy these books when you get to them.